rec. 1-2 July 2015, All Hallows’ Church, Gospel Oak, London and 6 July 2015, Chapel of Tonbridge School, Kent, UK. 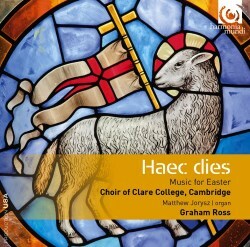 Graham Ross and the Choir of Clare College, Cambridge have already issued several CDs, each one linked to a season in the Church’s year. Previous releases have focused on Advent (review), Christmas (review), Passiontide (review), All Saints and All Souls (review) and Ascensiontide and Pentecost (review). Here is another very welcome CD in the series. As Graham Ross points out in his notes, the repertoire selected here spans five centuries – I presume he’s referring to the composed works since the plainchant, which appears at various junctures in the programme, will be even earlier. These plainchant items all come from the Easter Day Masses. The music has been discerningly chosen and has been arranged into suitable sub-groups within the programme. Pieces by Orlande de Lassus open and close the programme and they’re connected because the composer used some of the music in his setting of the hymn, Aurora lucis rutilat in his 8-part Magnificat. To get the desired Polychoral effect in the hymn the singers were arranged in two concentric semi-circles for this recording. It works very well indeed and the performance is exuberant. The Magnificat setting alternates verses in plainchant and polyphony though two verses use a solo quintet whose music is flamboyantly decorative. Incidentally, though it’s not mentioned anywhere in the documentation that I could see the choir sings Taverner’s first and better-known setting of Dum transisset Sabbatum. The contemplative tone of the music means that the ’Alleluias’ are thrown into sharp relief. This magnificent piece is given a fine performance. William Byrd’s joyful setting of Haec dies comes off splendidly. The Clare singers make the polyphony sound really exciting, especially the ‘Alleluias’ at the end. Matthew Martin’s piece was commissioned by Ross and his choir and here receives its first recording. Martin goes beyond Byrd in that he adds to the text set by the Tudor master a verse from Psalm 106. Whereas Byrd’s piece is extrovert and jubilant throughout Martin begins in that vein but when he gets to the words from the psalm he changes tack, writing in a more restrained and legato fashion. The opening jubilation is revisited but then, in another surprise, there is a quiet ending. The choir’s music is full of interest and there’s an often spectacular independent organ part. This is a fine piece. Some earlier British composers also feature. In Vaughan Williams’s ecstatic Easter I was impressed by baritone Hugh Popplewell. His singing is excellent and I particularly admired his effortless top register. Stanford’s splendid anthem, Ye choirs of new Jerusalem is very well done indeed. From an earlier generation we hear S S Wesley’s Blessed be the God and Father, which features a very pleasing soprano soloist (Alice Halstead). This anthem was composed for an Easter Day service in Hereford Cathedral in 1853 and I was amused to learn from Graham Ross’s note that on that occasion the only choral forces available were some trebles and a solitary bass, who happened to be the Dean’s butler! Here, of course, a full SATB ensemble is on hand. For me, this piece never quite lives up to the promise of the opening pages. On the other hand, Patrick Hadley’s My beloved spake most certainly does sustain the promise of its arresting opening. It’s a magnificent, sensual anthem and it’s very well done here. I loved the performance of L’Héritier’s Surrexit pastor bonus. This is a contemplative piece and Graham Ross allows the long, leisurely lines to unfold with just the right amount of space. The L’Héritier is intelligently paired with Byrd’s similarly contemplative Pascha nostrum. A good deal of thought has gone into the planning of this programme. Equally, it’s obvious that the performances have been scrupulously prepared. Despite the annual change of personnel that is inevitably part and parcel of collegiate choirs the Clare College choir achieves remarkable consistency – and excellence. The performances here are in the best traditions of the house. Two venues were used for the recordings. I imagine that it was the five pieces that need an organ that were recorded in the Chapel of Tonbridge School, taking advantage of the fine instrument there. Matthew Jorysz, who was the college’s Organ Scholar until the summer of 2015, contributes memorably from the organ loft – he’s now Assistant Organist at Westminster Abbey, by the way. In both venues excellent sound has been achieved by John Rutter, who has been engineer and producer for all this series of discs, I think. My experience of Harmonia Mundi releases is that their documentation is always first class and that’s the case here. This is a most desirable collection of Easter music.